A Pakistani homemade airplane, built by Muhammad Fayyaz, has cost the man his freedom. According to Pakistan Today Punjab Police arrested the man for not filing appropriate papers with the Civil Aviation Authorities. Apparently he did not acquire the necessary permits to build the plane, and he was also accused of performing aerobatics in the craft. 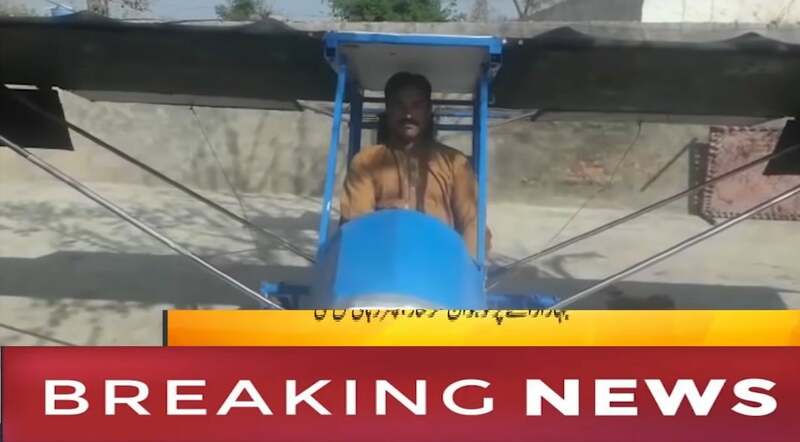 According to Fayyaz, who worked as a popcorn vendor and security guard in the town of Arifwala, he built the airplane himself. He said he had the inspiration to build the homemade airplane after watching National Geographic’s Air Crash Investigation series. Watching the show left him with a desire to become airborne, so he began to plan how he would build his own homemade airplane. Fayyaz saved money from his earnings and sold a field to help cover the cost of manufacturing the plane. However, he still did not have enough money for the pieces he needed. So, he sold a field and took out a loan from a bank to finance the shortfall on his homemade airplane plans. According to Independent.co the plane weighed 92kg (200lbs) and cost a total of Rs50,000 ($725 USD) to build. On Monday the day had finally come for Fayyaz to test his homemade aircraft. He taxied it out to a length of road where there were no obstacles in the way of his flight path, pushed the throttle forward and roared off the road surface. According to witnesses, more than 500 people were there to watch his victorious performance. Muhammad circled the field several times, then successfully landed the plane, only to be met by police who arrested him. “I made the aircraft with my hard work. My plane can fly till 1000 feet…” Fayyaz said. He was very proud of his achievement, but his pride was not enough to convince police to release him. The charges against Fayyaz include building and flying the homemade plane without a permit. According to police he failed to file proper paperwork with the CAA regarding his plans to fly the airplane. Pakistan has very strict laws governing its airspace, and no aircraft is permitted to operate there without notifying proper authorities. Recent reports of an Israeli plane flying into Pakistan to deliver Israeli Prime Minister Benjamin Netanyahu to a meeting in Islamabad have been denied by officials. This, coupled with a reported UFO in the sky over Karachi which officials believe could have been a drone, has kept the government busy fielding questions. Now it appears they will have to answer questions regarding the construction and flight of homemade aircraft as well. Fayyaz told the press that he had reached out to authorities, but no one had responded. “Give me one chance so that I can prove that I am a patriotic Pakistani. I informed every department but no one responded me,” he said in an interview. It is unclear what the final decision in this case may be, but hopefully Fayyaz will soon be free to return home and possibly take his homemade airplane with him.